The cold weather has arrived in Columbus, OH, and you’ll have your heater working hard to provide you with the comfort necessary to make it through to the spring. But a hard working heater can run into many problems—and when these happen, you’ll need to call in professional repair specialists to handle the trouble before you end up with a house filled with icicles. 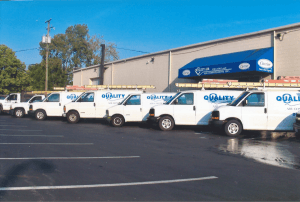 At Quality Air Heating and Air Conditioning, we are on duty 24 hours a day to come to your rescue for heating repair in Columbus, OH. We have extensive experience with working with heaters of all types, from gas and electric furnaces to geothermal heat pumps. Excessively clogged filters: For heaters that use forced air (furnaces, heat pumps), a filter does the job of protecting the interior of the system from dust, dirt, and other debris. The filter should be changed once a month during the season when the heater receives the most use, or else excessive clogging can lead to debris infiltrating the heating cabinet. This will cause numerous malfunctions that will require professional repair: damage to motors, compressors, fans, belts… almost any component will suffer from a filter clog. Leaking refrigerant: For heat pumps, whether they are air-source or ground-source (geothermal), refrigerant is the key component used to carry out heat exchange. Refrigerant runs through the heat pump in a closed loop and does not dissipate during normal use. But if leaks develop, the loss of refrigerant will seriously impair the system from operating, causing icing on the coils and a drop in heating power. Professionals must seal the leaks and recharge the refrigerant. Electrical trouble with thermostats: Whether you have a single thermostat, or you have multiple ones for a zone control system, electrical malfunctions will hamper their ability to control the heater, leading to problems such as a heater that won’t turn on or one that won’t turn off. Sometimes a thermostat unit will need replacement; other times technicians can repair the wiring to restore the connection between the thermostat and the heating system. Don’t hesitate when you notice trouble with your heating: a small issue will soon turn into a large one that will cost more to repair. Call in experts with the training and certification necessary for excellent heating repair in Columbus, OH. All the technicians at Quality Air Heating and Air Conditioning are NATE-certified so you can rest easy that we have the skills needed to deliver you the heating repairs to help you through the winter.